I've been stalling for days, but it was time to dismantle the vegetable garden (such as it was). Since I have it on a roof deck, getting the soil, compost, and plants up there is a chore, but getting them down is easy! I dumped all the pots over the side (very satisfying) and got all the hoses coiled up, tomato cages tied down, and pots stacked for winter, then I went back down and got all the plants out of the soil and put them in the yard waste. The rest of the soil was raked into the side yard, which could probably use it. I was left with 1 cup of green cherry and grape tomatoes, and a hankering n ot to waste them. Enter The Joy of Pickling! 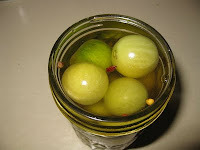 I made a half-batch of Pickled Green Cherry Tomatoes (page 145), which are refrigerator pickles. As I didn't have dill sprigs I used dried dill, and I didn't have horseradish root so I made do with a small spoonful of prepared horseradish. So the liquid is cloudy because of the horseradish, but hopefully the taste will be the same. I put a little label on it: Eat After 10/21/09. Supposedly it lasts 2 months in the fridge. We'll see.